At our house there would be a revolt if I didn’t roast our Thanksgiving turkey slathered in herb butter and serve it with shallot pan gravy prepared from the drippings. And, our clan definitely expects me to make Southern cornbread and leek dressing to accompany the bird. Where I get some leeway, though, is with the sides for my family leaves those choices up to the chef (moi!). This year I’m turning to two favorites–Brussels Sprouts, Apples, and Bacon as well as Roasted Butternut Squash and Pears with Blue Cheese. Striking with their vibrant autumnal hues and robust flavors, either or both of these dishes would make a delectable accompaniment to your bird. Each recipe serves six, but can be doubled if needed. 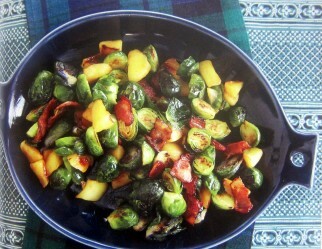 A trio of interesting ingredients, including assertive Brussels sprouts, salty bacon, and sweet apples, combine to make this a tempting side dish. These sprouts, which are blanched, then combined with sautéed apples and bacon, are particularly good with roasted poultry. 3. Sauté bacon in a large, heavy skillet over medium heat until browned and crisp. Remove with a slotted spoon to drain on paper towels. Pour off and discard all but 2 tablespoons of the drippings. Return the pan to medium heat and add the butter. When hot, add the apples and cook, turning often, until softened and just lightly browned, about 5 minutes or longer. Add the Brussels sprouts and bacon to the skillet. Stir and cook until all ingredients are heated through, 2 to 3 minutes. Season with salt to taste. 4. Mound vegetables in a serving bowl and sprinkle with parsley. Serve hot. For this cold weather side, you roast a pan of diced butternut squash and another of diced pears, both of which are flavored with curry-scented olive oil. Then you toss them with honey and sherry, and sprinkle the duo with toasted walnuts and crumbed blue cheese. And, here’s the best part, this dish, easily transported, can be completely assembled several hours ahead, and needs only minutes of reheating in the oven. 1. Arrange racks at center and lower positions, and preheat oven to 375 degrees F. Oil two large rimmed baking sheets and have ready a shallow 2-quart casserole. 3. In a small bowl, whisk together the curry powder and olive oil. Add the squash to a large mixing bowl, toss with half of the curry oil, and spread in a single layer on one of the baking sheets. Add the pears to the same bowl, toss with the remaining curry oil, and spread in a single layer on the other baking sheet. Salt and pepper the squash and the pears, and sprinkle each with some of the remaining curry powder. 5. Transfer the squash and pears to the casserole. Whisk together the honey and sherry, and pour over the squash and pears, stirring gently to coat well. Season with more salt if needed. Sprinkle with walnuts and blue cheese. (The dish can be prepared 5 hours ahead; leave loosely covered with plastic wrap at cool room temperature; reheat uncovered in a preheated 350 degree F oven until warm and cheese has started to melt, 10 to 15 minutes.) Serves 6. 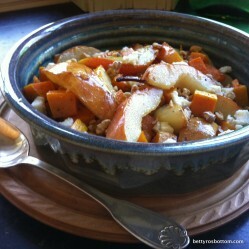 Note: Look for peeled butternut squash in the produce section of the supermarket, a great time saver. About 30 ounces peeled squash should yield 6 cups. Note: To toast walnuts, spread them on a rimed baking sheet and place in a preheated 350 degree F oven until lightly browned and fragrant, 5 to 6 minutes. Watch carefully so that they do not burn. Remove and cool. This entry was posted in Food News and tagged apples, Brussels sprouts, butternut squash, pears, sides, Thanksgiving by brosbottom. Bookmark the permalink. 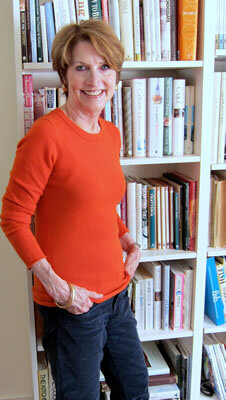 Just made the Roasted Carrot, Parsnip & Garlic soup today from “Soup Nights”. Oh My Goodness it is fantastic! It might be my first course before the Turkey. We are doing two turkeys this year – one in the oven and the other smoked so I’ll be able to make Betty’s Smoked Turkey, Prosciutto, Fontina and Garlic Mayo on a Toasted Baguette for after Thanksgiving.